It was only our second trip of the month, but we could not have asked for a better day at sea. In perfect conditions, we set out on our trusty whale watching vessel, Whale Whisperer into the blue beyond. Without a single cloud in sight, our first member of the big 5 was none other than the Great White shark. Two sharks were patrolling the cage diving vessels in the shallow waters of Joubertsdam. The first was quite a large shark that launched itself at the bait line, thankfully, our bait handlers were on the ball as they pulled it straight out the mouth giving us a ‘jawsome’ view. After leaving the sharks behind, we came across a cape fur seal over De Clyde Reef munching on a meal he caught in the vast kelp forests. Unfortunately, the seal disappeared into the abyss as we approached him further. We journeyed on behind the island in search of the elusive spout of the Byrde’s whale to no avail, the deep oceans looked very empty of life. 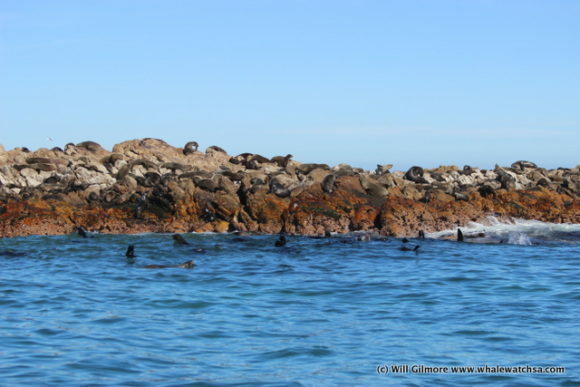 The seals at Geyser Rock provided us with a lot of entertainment both in and out of the water. The cape fur seal, is a sub species of the Brown Fur seal, which is also found in the cool waters of southern Australia. 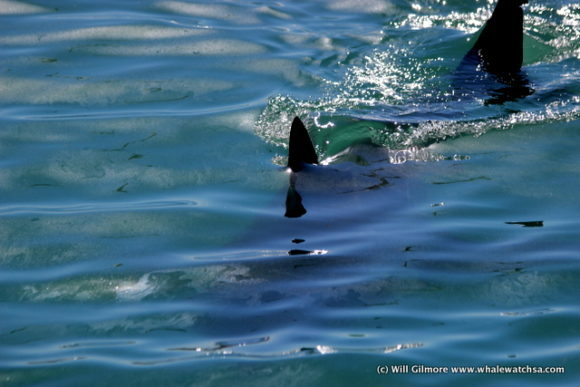 These animals are the favourite meals of the great white sharks and it is this time of year we may start to see a transition from sharks in the shallows towards the island. It is at dyer island were the great white sharks are most often seen predating on the seals as the pups born in the previous year start to learn to hunt for themselves. At Dyer Island, we hoped to spot the smallest member of the big 5, the very endangered African Penguin. There were a number of penguins on the island, but were generally hidden behind some of the boulders. Around the southern African coast, there has been a significant drop in penguin numbers, 95% alone on Dyer Island itself. It was at this moment we had some great news from crew on land. 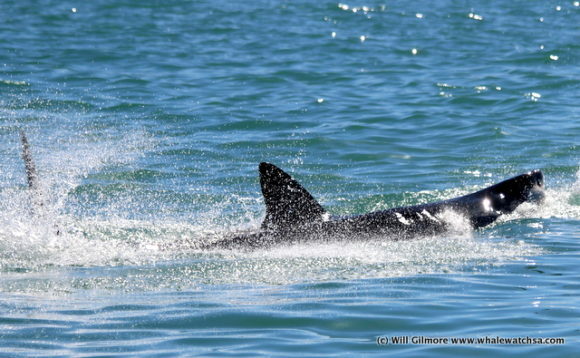 Someone had spotted breaching Southern Right Whales just off Danger Point. We quickly made sure everyone was ready to make the speedy journey towards the point. 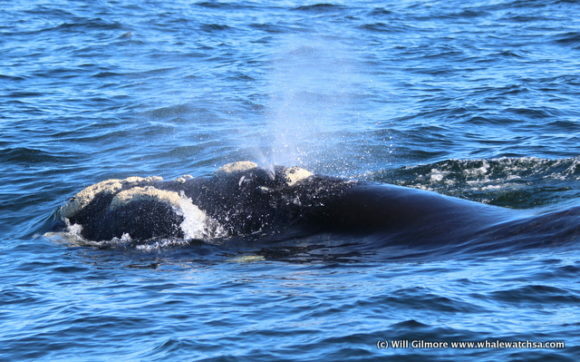 As we arrived in the area, our skipper/spotter, Francois, saw the distinctive V-shaped spout very close. 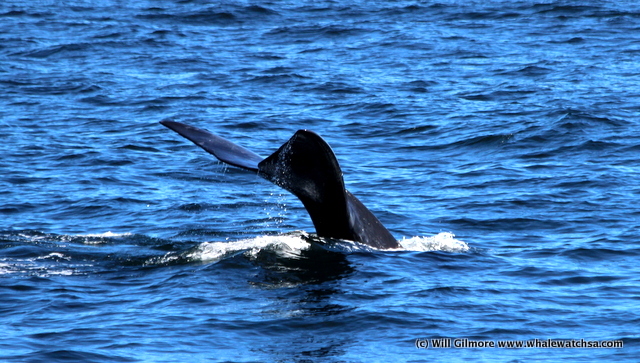 The whales were very calm and cooperative and made their way towards the vessel to check us all out. Amazingly, one of the calves was a brindle. 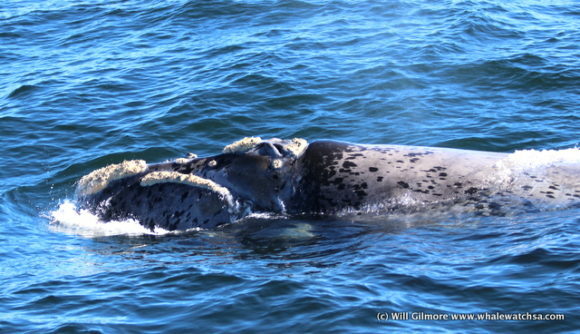 ‘Brindle’ means that the whale was born with a lot of white patches and becomes a spotty grey colour as it ages. Only 1% of the population of right whales is believed to have this colouration and most are males. Around 2% of the brindle population is born female. It was incredible to see the whales this time of year, we will not get our hopes up but hopefully this could be the start of our right whale season. The Southern Rights make their way to our shores to mate and give birth between June and December after 6 months feeding in subantarctic waters. 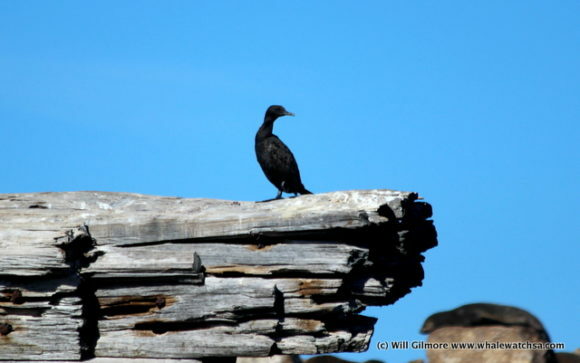 Amongst all the commotion caused by the whales, there were plenty of bird species in the area, these included; the awesome cape gannets, cape cormorants, and even a lone African penguin. We decided to leave the whales behind, as we did not want to disturb them. 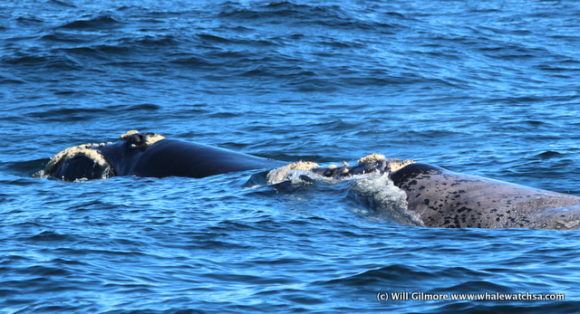 The whales, however, were not finished with us as the popped up right in front of the vessel. 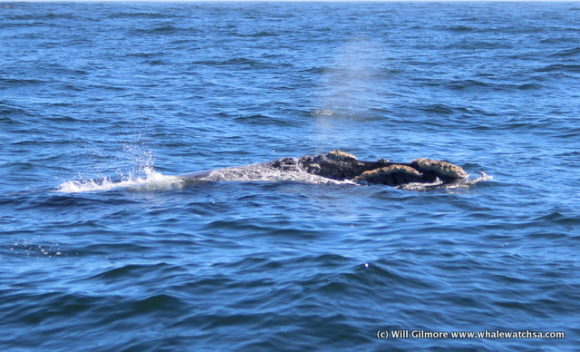 As a final goodbye, the brindle whale decided to show us his fluke, wrapping up a breathtaking day on the water.